1740s ~ 1750s: he performs in Kyôto as a koyaku; his first stage name is Tatsuoka Mantarô. 1757: he becomes wakashugata and takes the name of Tatsuoka Mansaku. End of the 1760s: he becomes sakusha and works with his father Tenmaya Kyûshichi. 11th lunar month of 1769: Mansaku works under the supervision of his father in Kyôto on the kaomise drama "Tatsu no Itten Renri no Kachidoki". 11th lunar month of 1776: Mansaku works at the Kado no Shibai on the kaomise drama "Ehôgura Sankai Meisho", which is produced by Ogawa Kichitarô I. 4th lunar month of 1777: premiere of Namiki Gohachi's drama "Tenmangû Natane no Gokû", co-written with Nakamura Akei and Mansaku, which is produced by Ogawa Kichitarô I at the Kado no Shibai [casting]. 11th lunar month of 1777: Mansaku works at the Kado no Shibai, along with Nakamura Akei and Namiki Gohei, on the kaomise drama "Ôiri Kabuki no Tsuitachi", which is produced by Ogawa Kichitarô I and celebrates the shûmei of Shibazaki Rinzaemon II. 11th lunar month of 1784: Mansaku works in Kyôto at the Nishi no Shibai on the kaomise drama "Kuni no Hana Ôshimadai", which is produced by Nakayama Ihachi II. 11th lunar month of 1787: Mansaku works as a tatesakusha, along with Namiki Shôzô II, in Kyôto at the Nishi no Shibai on the kaomise drama "Koko ni Kiwamaru Gojin no Sonae". 2nd lunar month of 1788: premiere at the Ônishi no Shibai of the drama "Gishinden Yomikiri Kôshaku". A drama written by Nagawa Shimesuke I, Namiki Shôzô II, Mansaku and Shimada Tsuruzô. It was supposed to be staged first in Kyôto at the beginning of the month at the Nishi no Shibai but the theater was destroyed by fire the 29th day of the 1st lunar month. The troupe goes to Ôsaka to perform at the Ônishi no Shibai and to celebrate the shûmei of Kataoka Nizaemon VII. 1st lunar month of 1793: premiere at the Naka no Shibai of the ni-no-kawari drama "Keisei Yanagi Zakura", the first yanagisawa-sôdômono in Kabuki history, written by Mansaku and Chikamatsu Tokusô [more details]. The play is a huge success and is staged in Ôsaka from the 1st day of the 4th lunar month up to the 17th day of the 5th lunar month. Then, the troupe moves to Kyôto to perform it at the Kitagawa no Shibai from the 19th day of the 5th lunar month to the last third of the 7th lunar month! 1st lunar month ~ 3rd lunar month of 1794: premiere of Tatsuoka Mansaku's drama "Keisei Haru no Tori" , which is famous for its "Umagiri" scene and is produced by the zamoto Asao Okujirô I in Ôsaka at the Kado no Shibai [more details]. 11th lunar month of 1794: Mansaku worked in Ôsaka at the Kado no Shibai, along with Chikamatsu Tokusô and Morita Monkyô, on the kaomise drama "Tatematsuru Chibako no Tamamono". 11th lunar month of 1795: Mansaku works with Chikamatsu Tokuzô and Namiki Shôzô II on the kaomise drama "Ichiban Yari Tôkai Suzuri", which is produced by Fujikawa Hachizô III (who celebrates his shûmei) at the Kado no Shibai; others main actors are Nakayama Bunshichi II, Sawamura Kunitarô I, Arashi Hinasuke II, Arashi Koroku III, Nakayama Bungorô I, Yoshizawa Iroha I, Mimasu Matsugorô I, Yamamura Giemon II, Yamamura Tomoemon I and Asao Sennosuke. 4th lunar month of 1796: premiere at the Kado no Shibai of the drama "Hade Kurabe Ishikawazome", written by Chikamatsu Tokuzô, Namiki Shôzô II and Mansaku [more details]. 7th lunar month of 1796: premiere of Chikamatsu Tokuzô's play "Ise Ondo Koi no Netaba", co-written with Namiki Shôzô II and Mansaku, in Ôsaka at the Kado no Shibai [casting]. 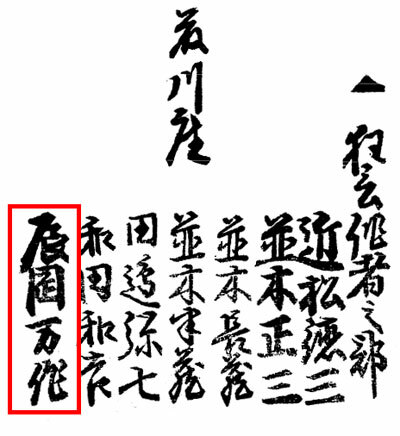 10th lunar month of 1796: Mansaku works at the Minamigawa no Shibai, along with Namiki Shôzô II, on the kaomise drama "Ebisu Daikoku Megumi no Kurairi", which stars Ichikawa Danzô IV, Yamashita Kinsaku II, Asao Tamejûrô I, Nakayama Bunshichi II, Anegawa Shinshirô III, Yamashita Yaozô I and Ichikawa Danzaburô IV. The troupe moves to the Naka no Shibai in Ôsaka in the 11th lunar month to perform the same program for 10 days. 11th lunar month of 1804: Mansaku works in Ôsaka at the Naka no Shibai, along with Nagawa Tokusuke I, on the kaomise drama "Minoriyoshi Kane no Naruki". 1st lunar month of 1807: Mansaku plays in Ôsaka at the Kado no Shibai on the ni-no-kawari drama "Keisei Takasago no Matsu", which is produced by Yoshizawa Minosuke. 3rd day of the 9th lunar month of 1809 : Mansaku dies in Ôsaka. Tatsuoka Mansaku was an important Kamigata playwright who was active from the end of the 1760s to the second half of the 1800s. He worked on more than 50 original dramas. When Namiki Gohei I left Ôsaka to settle in Edo in Fall 1794, the two leading playwrights in Kamigata were Chikamatsu Tokuzô and Tatsuoka Mansaku. The former one excelled in writing sewamono while the latter one was the jidaimono expert. The 3rd day of the 9th lunar month of the 6th year of the Bunka era was the 11th of October 1809 in the western calendar. Mansaku is assisted by Chikamatsu Tokusô and Nagawa Shimesuke I.